The authors are grateful to the University of Johannesburg and the National Research Foundation (NRF, South Africa) Incentive Funding for Rated Researchers (Grant No 91059) and Collaborative Postgraduate training programme (Grant No. 105295) for the financial support. Carla Candeias is thankful to the Portuguese Institutions University of Aveiro, IU GeoBioTec and to FCT (UID/GEO/04035/2013 and SFRH/BPD/99636/2014) for financial support of her work. Dr Langenhoven, Delicia, Department of English, University of Johannesburg, South Africa, is thanked for the language correction of the early version of the manuscript. Anonymous reviewers and the editor of the journal are acknowledged for their valuable comments, which helped to improve the manuscript. ATSDR, Agency for Toxic Substance and Disease Registry. (2003). Toxicological profile for mercury. U.S. Department of Health and Humans Services, Public Health Humans Services, Centers for Diseases Control. Atlanta. https://www.atsdr.cdc.gov/toxprofiles/tp.asp?id=115&tid=25. Last accessed January 2019. ATSDR, Agency for Toxic Substances and Disease Registry. (1990). Toxicological profile for copper. U.S Public Health Service. Agency for Toxic Substances and Disease Registry, Atlanta, G.A. https://www.atsdr.cdc.gov/toxprofiles/tp7.pdf. Last accessed January 2019. ATSDR, Agency for Toxic Substances and Disease Registry. (1992). Toxicological profile for vanadium. Prepared by element Associates, Inc., Agency for toxic substances and disease registry, US public health service, Atlanta, GA. Available at http://www.atsdr.cdc.gov/toxprofiles/tp58.html. Last accessed January 2019. ATSDR, Agency for Toxic Substances and Disease Registry. (1998). Toxicological profile for chromium. U.S. Public Health Service, U.S. Department of Health and Human Services, Atlanta, GA. https://www.atsdr.cdc.gov/toxprofiles/tp132.pdf. Last accessed January 2019. ATSDR, Agency for Toxic Substances and Disease Registry. (2000). Toxicological profile for zinc. US Department of Health and Human Services. Public Health Service. http://www.atsdr.cdc.govytoxprofilesytp60.html. Last accessed January 2019. ATSDR, Agency for Toxic Substances and Disease Registry. (2012a). Toxicological profile for manganese. U.S. Department of Health and Human Services, Public Health Services. https://www.atsdr.cdc.gov/toxprofiles/tp.asp?id=102&tid=23. Last accessed January 2019. ATSDR, Agency for Toxic Substances and Disease Registry. (2012b). Toxicological profile for chromium. Atlanta, GA: U.S. Department of Health and Human Services, Public Health Services. https://www.atsdr.cdc.gov/toxprofiles/tp.asp?id=62&tid=17. Last accessed January 2019. Brown, L. S. (2000). Nutrition Requirements during Pregnancy. Jones and Bartlett Publishers, (pp. 1-24). Retrieved from: http://samples.jbpub.com. Last accessed January 2019. Del Valle, H. B., Yaktine, A. L., Taylor, C. L., & Ross, A. C. (Eds.) (2011). Dietary reference intakes for calcium and vitamin D. National Academies Press. Retrieved from: https://www.ncbi.nlm.nih.gov. Last accessed on January 2019. FAO/WHO Joint Expert Committee on Food Additives (JECFA). (2003). Summary and conclusions. 61st Meeting, Rome, 10–19 June 2003. www.chem.unep.ch/mercury/Report/JECFA-PTWI.htm. Last accessed January 2019. Foley, N. K. (1999). Environmental characteristics of clays and clay mineral deposits, USA: U.S. Department of the Interior. Retrieved from: http://minerals.er.usgs.gov/minerals/pubs/commodity. Last accessed January 2019. George, G., & Ndip, E. (2011). Prevalence of Geophagy and its possible implications to health—A study in rural South Africa. In 2nd international conference on environmental science and development IPCBEE (vol.4). http://www.ipcbee.com/vol4/37-ICESD2011D10046.pdf. Last accessed January 2019. HSDB, Hazardous substances data bank. (1998). Bethesda, MD, National Institutes of Health, National Library of Medicine. https://toxnet.nlm.nih.gov/newtoxnet/hsdb.htm. Last accessed January 2019. Howe, P., Malcolm, H., & Dobson, S. (2004). Manganese and its compounds: environmental aspects. In World Health Organization, Concise international chemical assessment document. Published under the joint sponsorship of the United Nations Environment Programme, the International Labour Organisation and the World Health Organization, and produced within the framework of the Inter-Organization Programme for the Sound Management of Chemicals. (No. 63, pp. 1–61). http://www.who.int/iris/handle/10665/42992. NIH, National Institutes of Health. (2009). In dietary supplement fact sheet: Calcium. http://dietarysupplements.info.nih.gov/factsheets/calcium.asp. Last accessed January 2019. Ralph, A., & McArdle, H. (2001). Copper metabolism and copper requirements in the pregnant mother, her fetus, and children. New York, International Copper Association. Copper in the environment and health. http://agris.fao.org/agris-search/search.do?recordID=US201700009048. Last accessed January 2019. Smith, J. C., & Hsu, J. M. (2018). Zinc, copper, chromium, and selenium. In: Nutritional Approaches To Aging Research. https://www.taylorfrancis.com/books/e/9781351083577/chapters/10.1201%2F9781351075121-6. Last accessed January 2019. USEPA, United States Environmental Protection Agency. (1997). 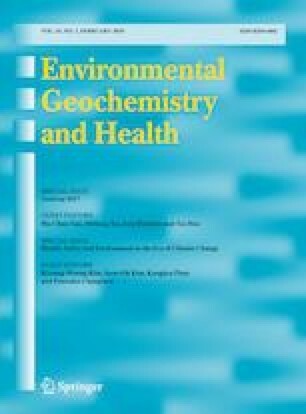 Mercury study report to congress volume IV: An assessment of exposure to mercury in the United States. http://www.epa.gov/ttn/oarpg/t3/reports/volume4.pdf. Last accessed January 2019. USEPA, United States Environmental Protection Agency. (1998). Toxicological review of hexavalent chromium. National Center for Environmental Assessment, Office of Research and Development, Washington, DC. https://cfpub.epa.gov/ncea/iris/iris_documents/documents/toxreviews/0144tr.pdf. Last accessed January 2019. USEPA, United States Environmental Protection Agency. (2003). http://www.epa.gov/earth1r6/6sf/pdffiles/tarcreek.pdf. Last accessed January 2019. USEPA, United States Environmental Protection Agency. (2005). Toxicological review of zinc and compounds (Cas No. 7440-66-6) in support of summary information on the Integrated Risk Information System (IRIS). http://www.epa.gov/iris/toxreviews/0426-tr.pdf. Last accessed January 2019.
WHO, World Health Organization. (1996). Trace elements in human nutrition and health. Geneva: World Health Organization. https://www.who.int/nutrition/publications/micronutrients/9241561734/en/. Last accessed January 2019.
WHO, World Health Organization. (2001). Arsenic in drinking-water. Geneva, World Health Organization. http://www.who.int/mediacentre/factsheets/fs210/en/print.html). Last accessed January 2019.
WHO, World Health Organization. (2010). http://www.who.int/entity/foodsafety/chem/. Last accessed January 2019.